All fruits and vegetables contain some amount of vitamin C.
Some cereals and other foods and beverages are fortified with vitamin C. Fortified means a vitamin or mineral has been added to the food. Check the product labels to see how much vitamin C is in the product. Cooking vitamin C-rich foods or storing them for a long period of time can reduce the vitamin C content. Microwaving and steaming vitamin C-rich foods may reduce cooking losses. The best food sources of vitamin C are uncooked or raw fruits and vegetables. Exposure to light can also reduce vitamin C content. Choose orange juice that is sold in a carton instead of a clear bottle. 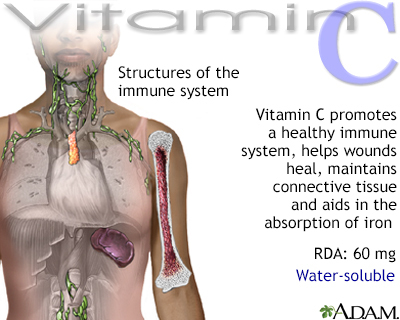 Serious side effects from too much vitamin C are very rare, because the body cannot store the vitamin. However, amounts greater than 2,000 mg/day are not recommended. Doses this high can lead to stomach upset and diarrhea. Large doses of vitamin C supplementation are not recommended during pregnancy. They can lead to vitamin C deficiency in the baby after delivery. Gingivitis is inflammation of the gums. 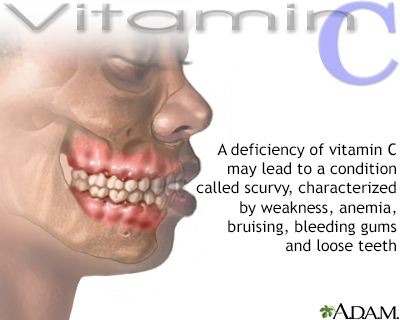 A severe form of vitamin C deficiency is known as scurvy. This mainly affects older, malnourished adults. The Recommended Dietary Allowance (RDA) for vitamins reflects how much of each vitamin most people should get each day. The RDA for vitamins may be used as goals for each person. How much of each vitamin you need depends on your age and gender. Other factors, such as pregnancy and illnesses, are also important. The best way to get the daily requirement of essential vitamins, including vitamin C, is to eat a balanced diet that contains a variety of foods. Smokers or those who are around secondhand smoke at any age should increase their daily amount of vitamin C an additional 35 mg per day. Women who are pregnant or breastfeeding and those who smoke need higher amounts of vitamin C. Ask your health care provider what amount is best for you. Hemila H, Chalker E. Vitamin C for preventing and treating the common cold. Cochrane Database Syst Rev. 2013;(1):CD000980. PMID: 23440782 www.ncbi.nlm.nih.gov/pubmed/23440782. 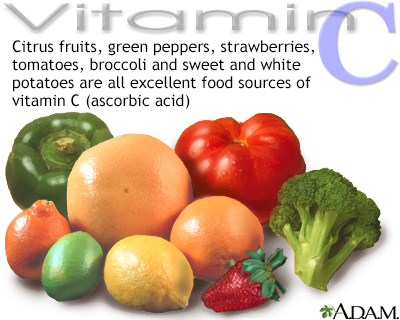 Ascorbic acid, or vitamin C, aids in many functions of the body, including the absorption of iron. Large doses of C do not usually cause toxicity because, as a water-soluble vitamin, it is simply excreted in the urine. People who tend to form kidney stones may find their condition aggravated by vitamin C supplementation or megadosing. A lack of vitamin C is usually found in malnourished older adults, leading to nutritional disease such as scurvy. Like most vitamins, vitamin C may be obtained in the recommended amount with a well-balanced diet, including some enriched or fortified foods.